In a press release today, ISAF and Rolex announced the winners of the 2013 ISAF Rolex World Sailor of the Year Awards. U.S. Coast Guard photo by Petty Officer 2nd Class Chris Harper. 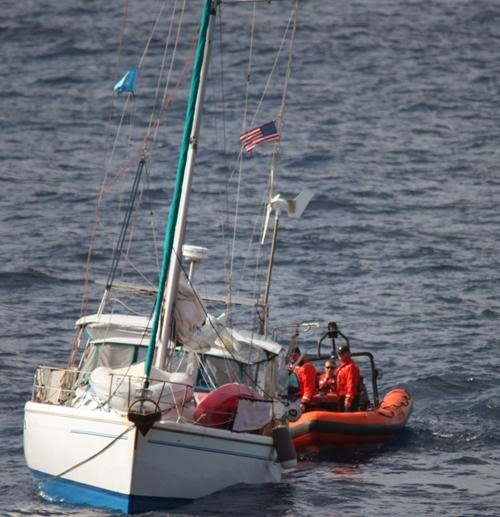 The Coast Guard and the crew of the Navy destroyer USS Cole rescued three people Sunday from the disabled 38-foot sailboat Wings approximately 210 miles offshore of North Carolina; the USCG also assisted the 42 foot Jammin (pictured) about 20 miles away from the Wings, when the same weather pattern left both sailboats with damaged rudders. We've got the full story, plus video, direct from the Fifth Coast Guard District, which serve's America’s Mid-Atlantic Region.